Gangliosides form ABO blood groups. 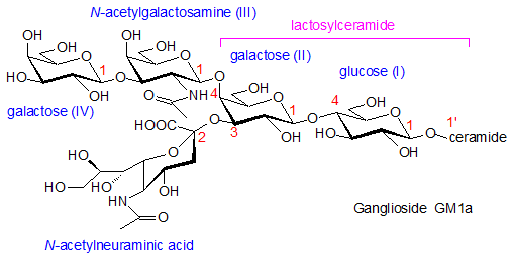 Do gangliosides always contain sialic acid? If true, then where is sialic acid in blood groups? So that's to say there shouldn't be a sialic acid group on ABO antigens, though sialyltransferases are capable of forming Lewis Antigens (Source). In the anabolic pathway the backbone structure is simply getting attacked by glycosyltransferases and the pathway goes the direction whichever one wins out (level of protein vs level of substrate). Being said, I'm unsure it's proper to say ABO antigens are produced from gangliosides, but if anyone finds some faults in my explanation please let me know! 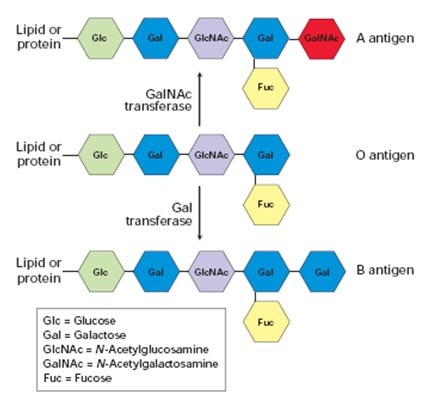 I'm looking into catabolic pathways that may produce ABO antigens by recycling gangliosides, probably resulting from some cleavages by other glycosyltransferases, I just haven't gotten there yet, I'll try to update if I find anything. Not the answer you're looking for? Browse other questions tagged biochemistry blood-group or ask your own question.